With the RTS Index up 30% year-to-date, foreign investors are drifting back into Russian shares simply because they are so cheap. But is the bluest of Russian blue chips and long-time market proxy Gazprom a buy again? Russian investment bank Renaissance Capital, or Rencap as it is affectionately known in Moscow, certainly thinks so. In a report titled “Gazprom: Discount season is ending”, the bank marked the stock up to “buy”. “We raise Gazprom’s [target price] to $9.0 (from $7.1), following better cost control demonstrated in the recent FY14 results, an improved outlook for exports and lower purchase costs on Central Asian gas. We re-iterate our BUY rating on Gazprom and prefer it to the three other largest Russian energy companies: Lukoil (HOLD, TP $52.0/GDR, CP $51.0/GDR), Novatek (HOLD, TP $105.0, CP $97.5) and Rosneft (HOLD, TP $4.1/GDR, CP $5.0/GDR),” the bank’s analysts Ildar Davletshin and Evgeny Stroinov wrote in a note. Gazprom has made a lot of investors a fortune in the past as the stock’s price soared following the government’s decision to remove the so-called ring fence, special restrictions that banned foreigners from owning shares in Russia’s most powerful company. During the boom years in the mid-noughties the stock rose to an all-time high of RUB365.26 ($15.41) on May 16, 2008, on the local market just before the Lehman brothers storm broke, then tanked to an all-time low of RUB86.60 ($3.19) on October 24 that same year. As of May 6, 2015, Gazprom shares are trading at RUB155.46 ($3.10) as of May 6, almost exactly where it was five years ago to the day in ruble terms, although less in dollar terms, RUB155.0 ($5.08). Rencap’s target prices are referring to the price of the shares on the international markets where the stock trades significantly higher, despite the lack of the ring fence, and cost $5.92 per share as of May 5. Still, irrespective of whether an investor buys in London or Moscow, Rencap are saying the upside in the stock is just over 50%. Looking at the stock in purely financial terms then buying Gazprom now is a no-brainer. But if you add in the political risks to both the state-owned company, and Russia as a whole, then the trade looks extremely risky indeed. Rencap’s upgrade comes partly as the company was minting money in the last quarter of 2014 after gas prices recovered and the company slashed its capex spending: capex was about $55bn in 2011 but Rencap estimate that this will fall to around $20bn a year. Given the company is generating cash of about $40bn a year, says Rencap, it will be spitting out some $20bn a year of free cash flow that can be returned to the government and minority investors. And it seems the process has already started. “In 2014, Gazprom generated its highest free cash flow ever, at almost $17bn ($5.9bn of that in the fourth quarter of 2014). A main reason for that was an $11bn drop in capital expenditures to just $33bn (although attributable capex was almost unchanged year-on-year in ruble terms),” analysts at Sberbank CIB said in a note on April 30. Gazprom shares are undeniably cheap when compared to pretty much any previous year, and thanks to a 2012 government order the company has started paying out dividends that are only going to go up. But Rencap are arguing that the nature of the company’s business has fundamentally changed. It won’t spend as much on capex; the EU demand for gas can only go up; and in addition to an existing $400bn supply deal to China, a second gas deal could be signed as soon as next week when Chinese President Xi Jinping visits Moscow to attend the May 9th Victory Day parade. “We think the biggest future driver will be the dramatic increase we expect in earnings cash conversion – from just 6% in the past five years to 55% in 2019E. We expect this to come from weaker capex (mainly benefiting from a weaker rouble) and stronger sales, as EU demand recovers and China starts importing Russian gas from 2019,” Rencap said in its report. However, when viewing the coin from the other side the political risks seem significant. Europe seems determined to wean itself off Russian gas eventually, even if will take years to do, which puts a question mark over the company’s long-term prospects. More immediately, Gazprom’s business arrangements in Europe are already under attack by Brussels. The European Union (EU) on April 22 charged Gazprom with violating competition laws by using its market dominance to overcharge clients in Central and Eastern Europe. “We find that [Gazprom] may have built artificial barriers preventing gas from flowing from certain Central Eastern European countries to others, hindering cross-border competition,” European Competition Commissioner Margrethe Vestager said in a statement. Vestager is out for blood and says EU studies found at least five EU states were being charged monopolistic rents. Under EU competition rules Gazprom could face a fine of up to 10% of its revenues if found guilty, or some $3.8bn, according to VTB Capital in Moscow. Gazprom rejected the charges as ungrounded, backed up by the Russian government and in particular by Foreign Minister Sergei Lavrov, who said the deals with the EU states were “in compliance with the law at the time of signing”. Moscow is also getting into a potentially even more costly legal battle with Kyiv, which said last week it intends to sue Gazprom for $16bn in damages as the 10-year gas supply contract signed in 2009 by former Ukrainian prime minister Yulia Tymoshenko was “unfair”. 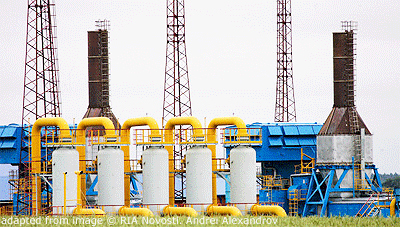 Gazprom has lodged a counter suit for $24bn for non-payment of gas delivered under the terms of the same contract. Both cases are due to be heard in a Swedish arbitration court. Despite all the rhetoric about reducing Europe’s dependency on Russian gas, however, the volumes exported there went up 8% year-on-year in April and are likely to climb further this year as western Europe’s economies recovery. Likewise, despite the on-going slug fest with Ukraine, it too doubled imports of gas from Russia in April as it starts stockpiling for later in the year while prices are low(ish). Taken all together, Rencap says that in the “new” Gazprom the stock will re-rate by 2019 when the China deal comes on stream, from a price to earnings ratio of x3.5 (where the stock is trading now) to x5 earnings, which would produce a 43% increase in the share price by itself, not counting bigger dividend payments, which may go up 26-fold, says the bank. That re-rating would move the London price of the stock from around $6 to some $18 in just a few years.